It is days like today that I am happy that I have the option of not having to go into my office space Toronto and instead work remotely from home. I woke up this morning to find my car buried in a snowbank and I did not have the energy to dig it out (too much Christmas leftovers last night). I had a great deal of work today and because I could not get my car out, I decided to work from home. All of my files are stored on my cloud server and if clients wanted to reach me at my Toronto office space, I gave the receptionist instructions to forward my calls to my cellphone. My clients hear the same friendly voice who always answers my calls. When she transfers the call, they believe that I am working at my downtown Toronto office space. This was working quite well until a client wanted to meet with me at my office space Toronto to show me some samples he had picked up from a new vendor – and needed to have me take some photos of the new products for his catalogue. I told him that I would call him back when I knew what time I would be available. I quickly called the receptionist and asked her to book me into an available Toronto meeting room in an hour or two. She told me that, because a number of people who have office for rent Toronto there had also chosen to work remotely, I had a choice of almost any Toronto boardroom they had. I chose the one right off of the reception area simply because it is one of my favourite boardrooms for smaller meetings. I then got back to my client and told him that I would be available in an hour (knowing that it would only take me about 45 minutes by public transit to get to my Toronto office space). 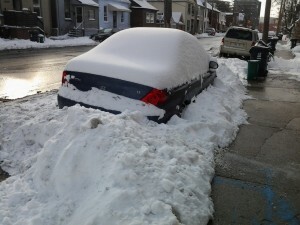 When I got back home from my meeting at my office space Toronto, I found that my car was still buried under the snow. Just now I discovered that more snow had been moved in front of, in back of, and to the side of my car. Looks like I will taking transit into the office tomorrow.